The Crucible takes place in Salem, Massachusetts in 1692. The action begins in the home of Reverend Parris, whose daughter Betty lies unconscious and appears very ill. Around midnight the night before, Parris had discovered Betty, his niece Abigail, and Tituba, his black slave, dancing in the woods, causing Betty to swoon. The local physician is unable to determine the cause of Betty’s illness. Mr. and Mrs. Putnam arrive and reveal that their daughter Ruth is also ill. There is talk in the village of an unnatural cause. Abigail warns her friend Mercy Lewis and the Proctors’ servant Mary Warren, not to reveal that they were all casting spells in the woods. Betty wakes, and Abigail threatens the other girls with violence if they tell anyone that she drank blood and cast a spell in order to kill Goody Proctor. Betty loses consciousness again. John Proctor and Abigail talk privately about their former relationship. Prior to the opening of the play, Abigail worked as a servant in the Proctor home. Elizabeth Proctor was ill at the time and Abigail took on more responsibility within the Proctor household. When Elizabeth discovered the affair, she dismissed Abigail. During their discussion, Abigail becomes angry with Proctor because he refuses to acknowledge any feelings for her. Betty wakes again and is hysterical. The well-respected Rebecca Nurse is visiting the Parris household and calms her. Prophetically, Rebecca warns Parris that identifying witchcraft as the cause of Betty’s illness will set a dangerous precedent and lead to further problems in Salem. Mr. Putnam asks Rebecca to visit Ruth and attempt to wake her. Ruth is the only Putnam child to survive infancy, and Mrs. Putnam is jealous of Rebecca because all of Rebecca’s children are healthy, whereas Mrs. Putnam had lost seven infant children. Putnam, Proctor, and Giles Corey argue with Parris about his salary and other expectations. Parris claims that a faction is working to drive him out of town, and he disputes their salary figures. Putnam, Proctor, and Corey then begin arguing over property lines and ownership. Putnam accuses Proctor of stealing wood from land that he does not own, but Proctor defends himself, stating that he purchased the land from Francis Nurse five months ago. Putnam claims Francis had no right to the land and, therefore, could not sell it. The Crucible opened in 1953, at a time when the Un-American Activities Committee operated. This underlies the play. Miller noted with horror the notion that conscience was no longer a private matter but one of state administration. The play’s themes are individual conscience, identity of the self, conflict with authority, fear and mass hysteria. These powerful themes all became apparent in this memorable production. In a simple setting with atmospheric lighting, Salem was recreated. With good use of the stage, some excellent groupings, tension was slowly built towards a dramatic and emotional climax. This was a large cast (18) and all performed well. Reuben Milne (John Proctor) and Lucy Knight (Elizabeth Proctor) were excellent and captured the couple’s tense relationship. Rueben’s performance was entirely believable and moving. He became the hero who follows his conscience and could only remain himself by dying. Lol Smith brought the naive and honest Cory to life. Brendan Sheppard showed well the decline of Hale and his remorse and guilt. Nicola Kelly gave a vivid portrayal of the vengeful Abigail. Glenys’s direction highlighted the claustrophobic and hysterical atmosphere with some remarkable set pieces: the confrontation between Proctor and Abigail, the hysterical girls in the vestry and the final parting of Proctor and his wife. The production was a moving experience with an emotional impact. 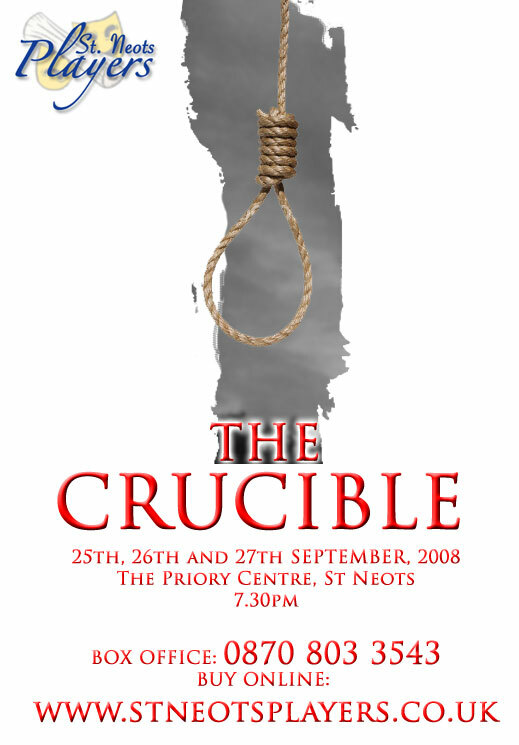 It demonstrated that The Crucible transcends its historical background.